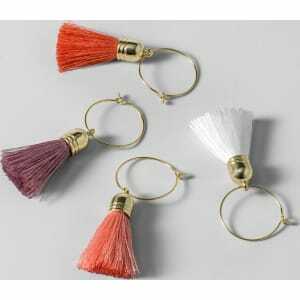 Wine Charm Accessories Pink/Red Set of 4 - Opalhouse from Target. nd the stem of clear or colorful wine glasses. The charms are easy to put on and take off, so you can spend less time labeling and more time chatting over your favorite red. This is your house. Where you create spaces as bold as your spirit. Collect objects as inspired as your dreams. Find pieces that remind you of every place you've been. Discover stories to inspire everywhere you have yet to go. This is Opalhouse. Color: Pink.